Big Truck Tacos is going national. 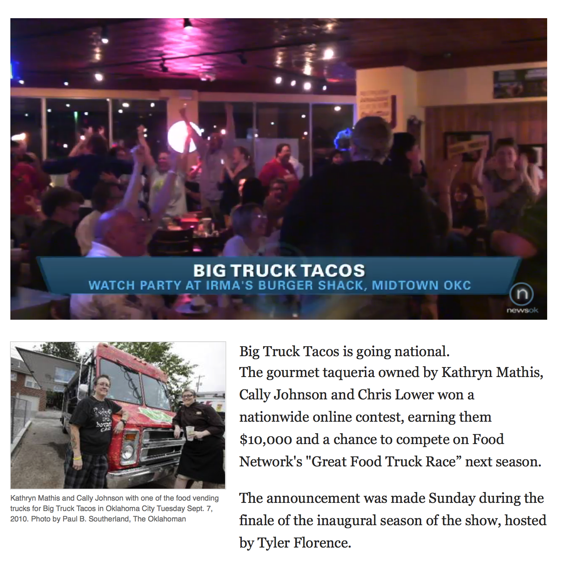 The gourmet taqueria owned by Kathryn Mathis, Cally Johnson and Chris Lower won a nationwide online contest, earning them $10,000 and a chance to compete on Food Network’s “Great Food Truck Race” next season. The announcement was made Sunday during the finale of the inaugural season of the show, hosted by Tyler Florence. Tears of joy, hugs and high fives were the only thing more prevalent than NoName Ranch burgers at Irma’s Burger Shack in Midtown, which hosted a watch party on behalf of Big Truck Tacos. When the announcement was made, the full house erupted with joy. Big Truck Tacos has been an unmitigated success. The owners originally thought it would follow the business model set by the Kogi Taco Trucks in Los Angeles, which uses Twitter to update customers of their route for the evening. Big Truck operates two mobile kitchens, but to the surprise of its owners, demand at their small headquarters on NW 23 and Dewey has been so high they’ve expanded the space and extended hours. More than 1,000 people showed for their one-year anniversary party in August. All three owners credit the power of social media for the passionate fans who voted them to victory. Johnson said they’ve not yet been notified when filming for the next season of the show will begin.